On this route we explore a circular 6km trail through one of the best known areas of Killarney National Park. Suitable for runners, walkers, hikers, strollers and dogs alike, this trail will take us through some of the most-visited areas of Muckross in Killarney National Park. With just a few detours off the well-beaten track, you can very easily travel along by the lake shore of two of Killarney’s famed three lakes. Read on to sample some of the magic of Muckross and maybe follow the route yourself the next time you’re in the neighbourhood. 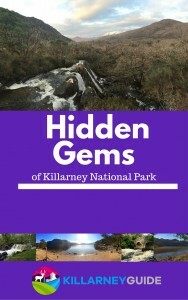 There are a number of different entry points to the Muckross area of the Killarney National Park. For many, the journey begins at the traditional epicentre – Muckross House & Gardens. Another popular starting point if arriving by car is the “new” entrance, closer to Killarney town. This is a great place to experience the splendour of Lough Léin and the McGillycuddy Reeks as they are thrust upon you as soon as you go past the gate. In between these two options is where we are going to start our journey from today. Situated directly opposite the Muckross Park hotel there is a small car park. This can fill up quickly during the summer months so be prepared to look for an alternative location to park nearby. This entrance allows you to approach Muckross Abbey from a different angle. In the winter time, it’s a bit more sheltered, so if the wind is coming down from the mountains and across the lake, you’ll be spared some of its ferocity if you approach from here. Right next to the car park there is a lovely park bench that is a great spot to take a break on a summer’s day. So maybe save that place for an end of walk drink or for some post-run stretches! The path leads out from the gate towards the ruins of Muckross Abbey which is just a few hundred metres away from the car park. Very close to the gate is the site of a geocache but I won’t divulge any more details to spoil the fun if you’re a ‘cacher! Muckross Abbey (where we came from). In true Kerry fashion, there is another option which is not on the sign…but let’s not go there (literally…). So we want to follow the “Kerry Way” trail, the one with the yellow hikers symbol. This leads off into the woods on a rough track. The remains of some of the trees that came down during Hurricane Darwin in February 2014 are still to be seen around the National Park. At this junction, the path had to be rerouted due to some giants tumbling over that day on the old path. Continue on this trail which naturally follows the shores of Lough Leane. During the summer time, the main path to Muckross House can get quite busy so this trail is a nice way to feel closer to the lake and step into the woods. The main path is never far away so it’s impossible to lose your way! You’ll likely hear the ‘clip clop’ of the jaunting cars plodding along on your left hand side. To your right, Lough Leane stretches out to meet the Reeks to the west and behind you towards the Lake Hotel to the North. If you are running along this trail, watch your step as the underlying limestone can makes the surface slippery in places. The trail rejoins the main path as we approach Muckross House. Outside of the winter months, you will see some of the Park’s Kerry Cows grazing in this area. Give them a wave and follow the path towards the house but veer right towards the lake shore to skirt around the grounds of the house. The lake that you are now seeing is Muckross Lake, or the middle lake, as it also known. Follow the path to trace the shore, passing by signs for the Old Boathouse and Dundag Beach on the right hand side. Shortly after this, the path opens up and you will see Torc Mountain rising up in front of you. At this point you will be able to take a left turn to begin the return loop of this trail. As you turn, keep an eye out for some of the Red Deer that often congregate in this area. The trail now continues along a relatively new forest track in parallel with the main path we’ve just followed. The paths will soon merge again but keep to the track that you’re on. As an optional extra, you can follow the track through the Stream Garden in the Gardens. The most direct route is to take a short cut across the grass back towards Muckross House. Skirt around the house and head over towards the Traditional Farms to continue back towards our starting point. Continue on past the old schoolhouse and turn right up the hill at the next junction. This gentle rise will give you the option to slope down to the Abbey or stay to the right and return back to the car park via a short 50m walk along the footpath of the N71. Either way, the distance is similar so don’t worry if you miss a turn! So there we have it – now we know where to go for a lovely walk or run around the well trodden paths of Muckross Abbey and Muckross House, yet still find solitude along the lake shore trails. We will return to these parts again but for now, enjoy this particular trail around the lakeshores of Muckross. I know of at least one particular dog who is happy to recommend it!